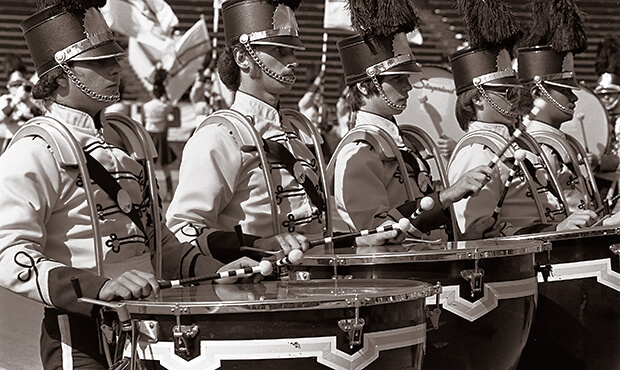 For the second year in a row in 1976, the Drum Corps International World Championships were held at the University of Pennsylvania's Franklin Field, an edifice built in 1895 that remains the oldest operating football stadium in America. While in Philadelphia, drum corps fans had the opportunity to partake in the United States' Bicentennial Celebration that was in full swing in "The Birthplace of American Democracy." The Seneca Optimists earned a spot as a finalist corps in its first year of a merger between the Seneca Princemen (founded in 1972) and Toronto Optimists (founded in 1952). The new corps was particularly noted for its bright yellow uniform jackets. 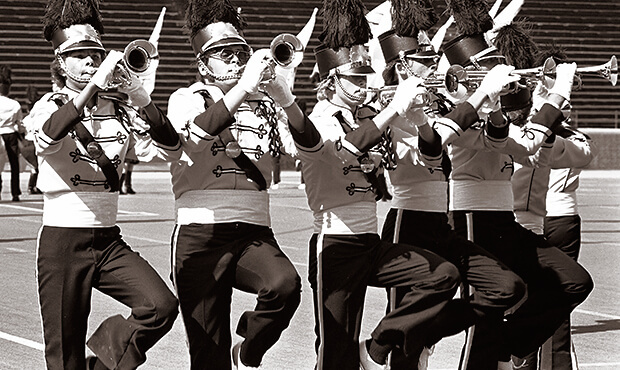 The corps' 10th-place 1976 production kicked off with "5th Movement, Rondo: Finale" from Gustav Mahler's "Symphony No. 7," a movement Mahler referred to as "bright day" after the "night pieces" of the second and fourth movements and the "shadow-like" waltz of the third. Premiered in 1908, the symphony remains the least recorded of his 10 symphonies. The Optimists stated the main theme with brass players goose-stepping toward the center of the field while playing to the front. A percussion feature of "Spank-A-Lee," composed by jazz musician Herbie Hancock, came off his 1974 jazz-funk album, "Thrust," which followed the massive success of his "Head Hunters" album of 1973. Hancock, a pioneer in electronic keyboards, explored sounds utilizing at least four analog synthesizers. On the football field, the mallet percussionists played the theme that was originally provided by an alto saxophone. The next piece was "Farandole," a combination of the classical elements of Georges Bizet's 1872 music for a play and the bombastic jazz arrangement by Bob James off his 1975 album, "Two." The first half of the arrangement was the classical Bizet version, followed by the James version. "L'Arlesienne" is loosely translated as "The Girl from Arles," referencing the southeastern France city near the Mediterranean. A farandole is a choreographed dance from the region, featuring participants holding hands while moving around an open circle. Bizet's work for the failed play lived on due to his good friend Ernest Guiraud, who arranged the "L'Arlesienne Suite No. 2" for full orchestra four years after Bizet's death. Don Ellis' "Indian Lady" came late in the program. The piece was from "Electric Bath," the Don Ellis Orchestra's 1967 album that won the 1968 Down Beat "Album of the Year" award. It was the band's first studio album following the success of "Live at Monterey" and "Live in 3 2/3 4 Time." Referred to as a "hoedown in 5/4," Ellis was inspired to write the piece after studying ethnomusicology at UCLA in 1964, where he came in contact with an Indian musician and became interested in writing Indian rhythms and styles into his works. The soprano bugle soloist at the beginning of the arrangement employed some of the same quartertone half-valve techniques (playing in the "cracks" between the notes) that Ellis used in his recording. Closing with a ballad, "Road Ode" was written by Gary Sims and Dan Woodhams for the Carpenters' 1972 album, "A Song for You." The song, much of it played to the backfield by the Optimists, led into a reprise of the opening of the Mahler selection heard at the start of the show, with some additional fanfare-like Mahler material added for good measure. For this week only, you can save on the Legacy Collection DVD that contains this complete Seneca Optimists performance, along with all finalists from the 1976 DCI World Championships. Discount DVD offer ends Monday, Dec. 9, 2014.